Copiapo, Chile (CNN) -- The 33 men trapped in a mine 2,300 feet below the surface in northern Chile face a physical, social, psychological and sanitary ordeal as they await a rescue that could take four months. The miners are sharing a space the size of a small U.S. apartment. They don't have a toilet, and it's damp and hot with little air circulation. They won't see the light of the sun until sometime in November or December. Doctors have given the men advice about how to keep their limited living space clean: Portions of a 131-foot-long (40-meter) shaft are being used as a latrine. The shaft is connected to the main 538-square-foot (50-square-meter) cabin, which is being used for sleeping, washing and praying. The men have split into two shifts so half can rest, while the others keep busy doing tasks, exercising or playing card games or dominoes. Stretchers that were stored in the rescue cabin are being used as beds. The rescue shelter was stocked with a first aid kit, rubbing alcohol, medicines, deodorant, toothpaste and other necessities. The men's sole lifeline to the outside world is a tube about 3.2 inches (8 centimeters) in diameter, through which food, water, clothing, video and radio equipment and whatever else is needed are stuffed. It takes 20 minutes for objects to make the trip. Initially, the miners survived by draining water from a water-cooled piece of equipment. To stay hydrated in the 85-degree Fahrenheit (29 Celsius) heat, each miner must drink eight or nine pints (4 liters) of water per day. Doctors and officials are feeding the men carefully, making sure they are properly nourished while seeing to it that all will be slim enough to fit into the 24-inch-wide (60 centimeter) rescue shaft being drilled for them. A social structure has formed, officials said. A shift leader at the San Jose copper and gold mine is fulfilling a leadership role, and another man with nursing experience is carrying out basic medical and psychological tests. They hold daily meetings and make decisions by consensus, according to a video the men sent to the surface Thursday. Maintenance mechanics among them have helped organize the space. 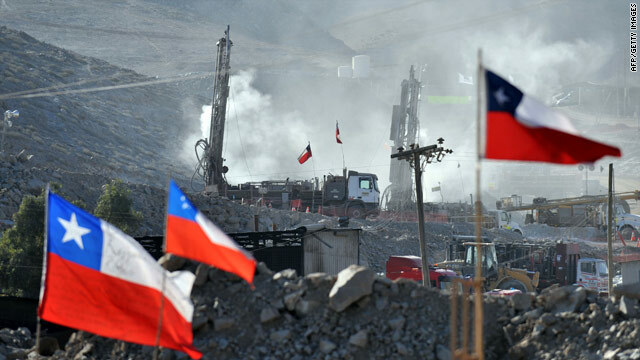 Three or four of the miners are showing signs of anxiety and depression, Chilean Health Minister Jaime Manalich said. The youngest trapped miner, Jimmy Sanchez, 19, is afraid of the dark, his girlfriend said. Mario Gomez, 63, a miner since he was 12, has emerged as a spiritual leader on whom others can depend for support, officials said. He has asked that religious figurines be lowered into the mine so that he can set up a shrine. Victor Segovia has been identified as the group's scribe, keeping a journal of the experience since it began with a tunnel collapse August 5. Another miner, an Elvis Presley fan, was expected to lead the group in singalongs to buoy morale. CNN's Brian Todd and Jim Kavanagh contributed to this report. 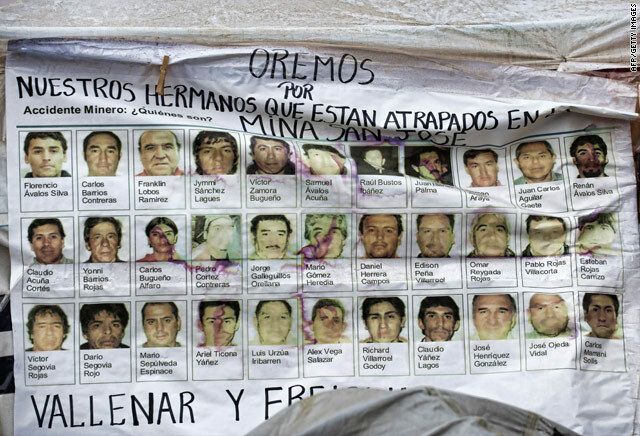 Dozens of miners trapped underground in a Chilean mine say they are alive and well. Just how small is space for 33 miners? CNN's Josh Levs uses 33 volunteers to illustrate the small space trapped miners are experiencing.